Average weight: male 3.13 g, female 3.24 g. Resident birds are slightly larger than those that migrate. 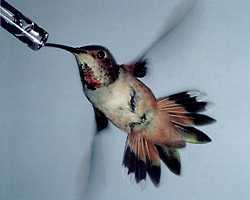 Adult male: Metallic bronze-green head and back, iridescent coppery-red gorget (throat), rufous flanks. Smaller than the female. 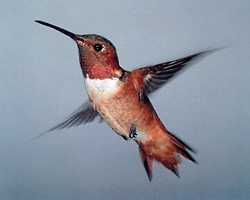 Adult female: Rufous back and sides, white breast, white throat with some red spots, rounded tail with white outer tips. Larger than the male. Extremely difficult to differentiate from female Rufous. Juveniles: Young of both sexes look like the adult female. Observed in Arizona, coastal California and Channel Islands, Florida, Georgia, Kansas, Louisiana, Massachusetts (Nantucket), Mississippi, Missouri, Nevada, Oregon, Pennsylvania, South Carolina, Tennessee, Texas, Virginia, Vancouver Island, B.C. Some birds migrate between Baja and coastal California, while others are year-round California residents.